The entire Norwegian Barents Sea (including both the southern and northern part) covers an area that is roughly twice the size of the Norwegian North Sea. Blocks that were announced in the 20th licensing round last year are shown in blue. The cluster of blocks west of the Loppa High received considerable attention. Illustration: NPD The southern Barents Sea has been open for exploration since 1980. Some 80 exploration wells have been drilled up to now, proving the presence of petroleum systems throughout the area. 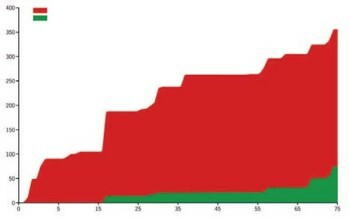 The Snøhvit field, with reserves (predominantly gas) of 191MMm3 o.e. (1.2Bboe), is already producing, while Goliat with oil reserves of 31MM3 o.e. (195 MMboe) is in the planning phase. The purple line defines the eastern limitation of eocene lava flows, while the black line denotes the western limitation of the petroleum potential. Green: Areas open for exploration; Brown. Not open for exploration; Orange: No further licensing yet; Yellow: Limited exploration drilling period. Illustration: NPD "The hydrocarbon potential of the Norwegian Barents Sea is underestimated," claims Matthias Daszinnies, research scientist with the Basin Modelling Group in SINTEF Petroleum Research, Trondheim, Norway. Basing his comments on a regional study that was recently presented in a meeting hosted by the Geological Society of Norway, he says this has to do with the practice of applying the petroleum systems of the North Sea and the Norwegian Sea as analogues. "While the Upper Jurassic Kimmeridge Clay black shale equivalent is the predominant source rock in those areas, we now know that we have to take at least three different source rocks of Mesozoic and Palaeozoic age into account when we do basin modelling in the Barents Sea," he says. Add to this the fact that the Norwegian Barents Sea has for a long time been regarded as mainly gas prone. Most recently, however, the Goliat and Nucula discoveries have shed new light on our perceptions of the kind of fluids that have been generated, and there is now a general belief amongst the oil companies active in the area that future exploration will result in more oil discoveries. Several recent discoveries, although small, give credibility to this prophecy. In addition, direct hydrocarbon indications are also evident on seismic data in several areas, thereby substantiating the impression that there are active petroleum systems present throughout the Barents Sea. "This is why it is of utmost importance to include multiple source rocks when we do petroleum system modelling in this huge geological province," Daszinnies says. 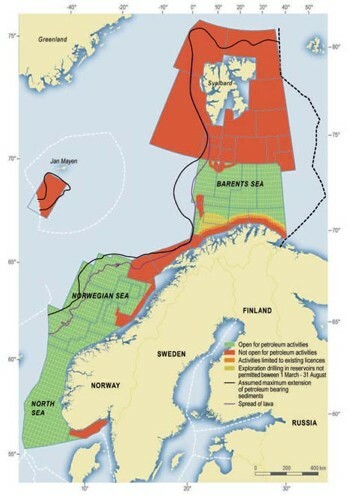 The total recoverable hydrocarbon resources of the Barents Sea are, according to the Norwegian Petroleum Directorate, 1.3Bm3 o.e. (8.2Bboe). 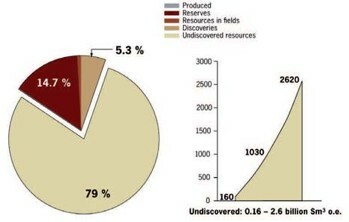 Their best case for undiscovered resources is, however, 2.6Bm3 o.e. (16Bboe). Creaming curve illustrating resource growth vs exploration wells in the Barents Sea during an almost 30 year long time span. The Norwegian Petroleum Directorate estimate of the current resources is approximately 350 MMm3 o.e (2.2Bboe). Up to now, Mesozoic shales of Triassic and Jurassic age have been looked upon as petroleum source rocks. However, biomarker and isotope signatures of oil samples from the Barents Sea suggest mixed oil sources. It may therefore be necessary to introduce Palaeozoic source rocks as shown by S. E. Ohm in an AAPG Bulletin scientific paper last year. "We have several reasons for incorporating Palaeozoic source rocks in our revised exploration models, and in a new regional basin modelling study of the southern Barents Sea we have investigated the significance of Palaeozoic source rocks in feeding Mesozoic carrier systems," says Daszinnies. In fact, in the Barents Sea, source rocks - some of them world class - have been identified at all stratigraphic levels from the Carboniferous to the Cretaceous, and it is possible that hydrocarbon generation has occurred almost continuously throughout geological history since the late Palaeozoic. As such, this geological province is almost unique. Consequently, it comes as no surprise that the technical success rate in the Norwegian Barents Sea is exceptionally high, with one out of three wells discovering hydrocarbons. The commercial success rate, however, is disappointing as the wells have mostly proven gas in small volumes, in an area that lacks a local market. 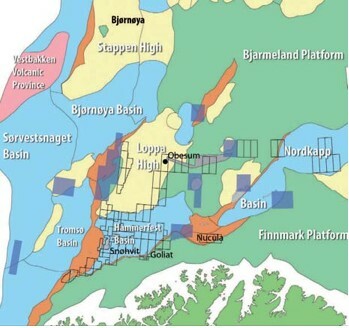 The next step, which is now being taken through the 20th round that closed last November, is to test innovative play models in new areas based on high quality geophysical data in combination with a fresh look at the petroleum system of this vast area, about the same as the Norwegian sector of the North Sea. 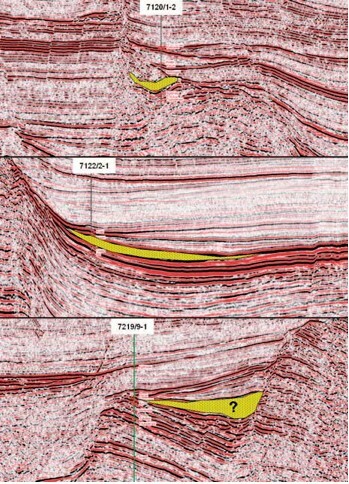 Three line segments from the NBR 2008 grid showing potential Lower Cretaceous syn-rift sand bodies predicted from an inversion technique employed by FugroJason. The lowermost line segment is from the down-faulted terrace west of the Loppa High where well 7219/9-1 apparently just missed the sand wedge. © Fugro Following 30 years of trial and failure (the first well was drilled in 1980), we know that the Barents Sea has live petroleum systems in the Norwegian sector. Several discoveries, including one producing gas field (Snøhvit), three oil finds (Goliat, Nucula, Obesum; Snøhvit also has an oil leg that is not being developed), and numerous wells with gas and oil shows, are all testimonials to such a statement. In fact, almost all the approximately 80 exploratory wells in the region have exhibited hydrocarbons. The problem is to find how the petroleum system works, as the geological record in the far north has been complicated by several phases of regional uplift and erosion. Three main episodes of uplift are recognised: in the Paleocene, in the Oligocene and in the Plio-Pleistocene. The most severe happened during the last five million years, corresponding to the Pliocene-Pleistocene ice age, when up to two kilometres of sediments were scraped off the continental shelf and dumped as a thick wedge along the western margin of the Barents Sea. Potential reservoirs and hydrocarbon source rocks have thus been buried far deeper than they are today, and they have been exposed to much higher temperatures. "The uplifts have also caused a redistribution of the hydrocarbons over laterally large distances and have directed the fluids to distal parts of the basin," explains Daszinnies. Explorationists in the oil companies are now trying hard to reveal the geological secrets of a huge basin with several play models that have been tested, and many others that need to be investigatd. And, notably, they are getting important support from the service industry as well as from research institutions. In preparation for the 20th round last year, with allocation of blocks expected in April this year, many companies invested in data acquisition and geological studies on a multiclient basis. The complexity of the tectonic evolution is demonstrated by this line that traverses from the southeast to the northwest, tying well 7220/6-1 (Obelix) that found only traces of hydrocarbons in limestones of Carboniferous-Permian age. The Loppa High has been uplifted and eroded, while the Bjørnøya Basin has experienced considerable subsidence with a thick Lower Cretaceous fill. © Fugro 3D seismic has become an important commodity in exploration, but in spite of this, 2D seismic is still highly valued as a way of improving our knowledge of the subsurface. Long regional lines, recorded to 10 seconds two-way time, occasionally also even to 14 seconds, have grown very popular in the Gulf of Mexico as well as on the Northwest European continental shelf . Since 2006, Fugro has acquired more than 33,000km of long offset (8km streamer) data in the Barents Sea. The programme will be expanded the next seasons offering the oil companies a fairly dense reference grid to play around with in 2010. "There is strong interest in the ultradeep data, down to 14 seconds, that we acquired in the Tromsø and Bjørnøya basins, both of which have a thick succession of Mesozoic and Cenozoic sedimentary rocks," says Tore Nordtømme Hansen, senior geophysicist with Fugro in Oslo, Norway. Parts of the new data has been run through a simultaneous inversion using the Fugro-Jason Geoscience Workbench. "In this way we are challenging some of the traditional ideas that inversion can only be applied in mature areas with plenty of well data. Based on excellent quality seismic we seem to be able to predict with a higher degree of confidence the presence of sandstones in diverse structural and stratigraphic settings. In fact, we have reason to believe the method is quite robust, giving us a new tool which should be very useful in frontier provinces," Hansen says. He adds that they are now capable of predicting the locations of turbidite sandstones in the Lower Cenozoic section filling in palaeodeeps in the Bjørnøya Basin. Having interpreted every line in their extensive data base (see page 40), Hansen is very optimistic about the future of the Norwegian Barents Sea. "While the Jurassic potential is not yet exhausted, there are many indications that both pre- and post-Jurassic reservoir intervals may be hydrocarbon bearing. From other studies we know that there are multiple source intervals throughout the geological column, and our own data helps to define reservoir intervals and structural evolution," he says. Snøhvit, operated by StatoilHydro, is the first offshore development in the Barents Sea. Natural gas is brought to land for liquefaction and export from the first plant of its kind in Europe (photo). 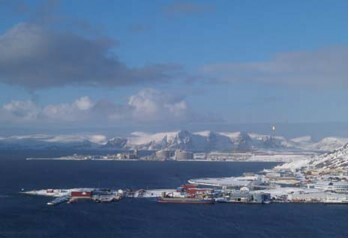 It is also the world’s northernmost liquefied natural gas facility. No fixed or floating units are positioned in the Barents Sea. Instead, the subsea production facilities stand on the seabed, in water depths of 250-345 metres. A total of 20 wells are due to produce gas which is transported to land through a 143-kilometre pipeline. Photo: Halfdan Carstens Good reservoir sandstones do not, however, generate play concepts by themselves. Rich and mature source rocks are a prerequisite for finding oil and gas. The challenge in the Barents Sea, as in many other frontier provinces with little well data, is to understand the spatial distribution and quality of the organic matter. "This is necessary to determine the composition and volumes of hydrocarbons made available for secondary migration," says research director Ute Mann with SINTEF Petroleum Research. "Until now, however, source rock modelling has not been applied on a routine basis in basin modelling studies. The main reason for this has been the lack of source rock modelling tools that can easily applied be in exploration studies," says Mann. She has recently co-authored a paper in Petroleum Geoscience describing software developed in-house that predicts the variation of organic facies in 3D volumes, thereby allowing for a quantitative estimation of source rock potential away from well control (OF-Mod). She adds that the processes of organic deposition are closely linked to the deposition of the inorganic matter, and a key control on the organic facies deposition is the initial basin topography (palaeo-water depth). "Our focus is now petroleum system modelling," Mann says. "For this purpose, estimates of initial source rock distribution, thickness and quality are key input parameters." In their regional Barents Sea study, a complex 3D basin model has been constructed for the Barents Sea using subsidence and uplift history, 3 different source rock models and thermal evolution as input parameters, giving maturation, expulsion and migration as output parameters. "The ultimate goal is to predict hydrocarbon volumes and phases," Mann concludes. It remains to be shown if her colleague, Matthias Daszinnies, along with many other petroleum geoscientists with long track records in the Barents Sea, are right when they claim that the Norwegian Barents Sea will develop into a major oil province.